In Tel Aviv, Israel some criminals are planning their next heist when they discover that the nearby maid is actually a spy. They capture the woman and point guns at her, when suddenly the cart that she was pushing turns into the Chameleon (from issue #9), who grabs the woman and makes their escape by crashing through a window. One of the crooks wonders if they should cancel their robbery, but the ringleader states that he shot the Chameleon and that they’re 20 stories high, so nothing could survive the fall – thus they’ll proceed to New York City as planned. Later, the “maid”, Val, is bandaging the Chameleon’s wounds. The mutant explains that he was able to morph into a parachute to save them from plunging to their deaths. Chameleon flirts with Val, but she states that she doesn’t get romantically involved with her business partners, and even if she did – he wasn’t her type. Chameleon morphs into a dashing, muscular blonde dude and states that he can be any type she likes – but the effort of the transformation reopens his wound and he falls to the floor in pain. Val states that she hopes he learned his lesson as Chameleon slumps into a chair, dejected. The two ponder whether or not they should follow the thieves to New York to fulfill their obligation to their employer. Chameleon turns on the TV just as “Inside Affair” comes on. The tabloid TV show is airing the footage of the TMNT that was taken back in issue #47. Upon seeing the Turtles, Chameleon states that it’s time for them to head to NYC. In the Big Apple, sleazy reporter McIntyre is raging at his crew to find the TMNT and to follow April O’Neil “night and day”. After the TV crew leaves, we see the “Inside Affair” sign morph into the Chameleon, who calls his partner Val and tells her to dig up all the info she can on April. Val isn’t happy that her partner is using her time to investigate a non-paying gig, but the mutant pleads with her to help him locate the TMNT since they were there when he mutated and might be able to answer some questions for him. Mikey calls April and asks if she and her assistant, Oyuki, want to hang out later. April is excited to hear her friend’s voice, but she says they’re busy covering a story. During the conversation, Val manages to trace the Turtles’ phone line, thanks to a wire tap. Meanwhile, the robbers have made their way to the City and begin making final plans. Outside their window, a strange gargoyle sits. Once the men vacate their room, the gargoyle morphs into Chameleon, enters the hotel and reads their plans. In the sewer, the Turtles are relaxing when Don spots a shadowy figure that looks like April, running away from them. Puzzled by her actions, the TMNT give chase and spot her on the roof of a museum. The lads are suspicious, but enter the building to see what’s going on. Inside they find the clothes that “April” had been wearing, but she’s nowhere to be seen. Suddenly, one of the mummy sarcophagi springs to life in the form of the Chameleon and captures Mike. A battle ensues and the Turtles manage to tie up their attacker. The Turtles demand to know what the story is, and Chameleon asks them if he can ever return to his normal form again – and if the Turtles can ever return to their “human” forms. He thought that since they’re friends of the Shredder, they should know. The TMNT angrily state that they’re not friends of Shredder’s and that they’ve never been human – although they were transformed by Mutagen, just like the Chameleon was – and as far as they know, the change is permanent. This information depresses Chameleon. Suddenly, Leonardo hears a noise on the roof. Chameleon notes that the thieves have arrived, and then attacks the distracted Turtles, knocking them cold. The shapeshifter mumbles that since the TMNT were of no help, he’ll have to try to salvage something from this “bummer night”. The dejected mutant walks off into the darkened corridors of the museum. The Turtles awake to find a smashed glass case and alrams going off. The guys think the Chameleon stole whatever is missing and take off before the police show up. Outside, the thieves wheel a large wooden box and gloat over their success stealing “the statue.” Little do they realize that the box they have the item stored in is none other than the Chameleon in disguise. 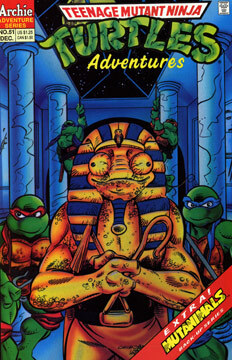 Additional Content: 5 page Mutanimals story by Clarrain, Brown, Talbot and Lawson.